Through the courtesy of Walter A. Rush, Controller of Radio, Department of Transport, Ottawa, CANADIAN RADIO DATA BOOK is able to publish a list of the first private commercial broadcasting station licences issued in Canada during the years 1922, to 1926. CFAC (Calgary Herald), Calgary, now a Taylor, Pearson & Carson station. CFCA (Toronto Star), Toronto, closed 1933. CJCE (Spratt-Shaw), Vancouver, closed 1925. CKCO (Province), 'Vancouver, closed 1940. CKCE (Ind. Telephone), Toronto, closed 1925. CJCD (T. Eaton), Toronto, closed 1926. CHCB (Marconi), Toronto, closed 1923. CFCE (Marconi), Halifax, closed 1923. CFCB (Marconi), Vancouver, closed 1923. CJNC (Winnipeg Tribune), Winnipeg, closed 1923. CKZC (Salton), Winnipeg, closed 1923. CJBC (Dupuis Freres), Montreal, closed 1923. CJCI (McLean Holt), Saint John, closed 1924. CHXC (J. R. Booth), Ottawa, closed 1927. CHCQ (Western Radio), Calgary, closed 1924. CFYC (Y. W. Odlum), Vancouver, closed 19.18. During the balance of 1922 thirteen additional licences were issued, those still operating being CKOC (Wentworth Radio), Hamilton; CFCH, Iroquois Falls, Ont. (now R.H. Thomson) ; CFCN, Calgary; CKCK, Regina; and CFPL (Free Press), London. Twelve licences were issued in 1923, the survivors being CKY (Manitoba Telephone), Winnipeg; CFQC (A. A. Murphy), Saskatoon, and CFCQ, Vancouver. Thirteen licences were issued in 1924, those continuing being CKCO, Ottawa; CNRO, Ottawa (now CBO), ; CFCT, Victoria, B. C. CL-INC (Toronto Radio Research Society) was licensed in May, 1924, and transferred to CKNC (National Carbon) in 1926. Nine licences were issued in 1925 including CKCL (Dominion Battery) Toronto; CNRV (now Canadian Broadcasting Corp.), Vancouver; CFCY, Charlottetowne, P. E. I.; DeForest Radio Corporation also established CJYC (closed 1928) ; CKGW (Goodenham & Worts) closed 1933: and CFMC (Monarch Battery Co.), Kingston, (closed 1928). Twenty-three licences were issued in 1926 including CFRB, Toronto; CKNC, Toronto, (closed 1935) ; CKGS Summerside, P.E.I. ; CJOC, Lethbridge; CHNS Halifax; CFJC, kamloops; CJRM, Mosse Jaw; and CKVC Quebec. A letter from the Calgary Herald, dated Sept. 23, 1941 says; "We gave CFCA (Toronto Star) credit as being the earliest Canadian broadcasting station. CFAC (Calgary Herald) began broadcasting May 2, 1922, with 10 watts power. We understand C F C A put programs on the air in April, 1922." Records, however, show that C F CA made a widely advertised broadcast on March 20, 1922 over an experimental station located at the, Canadian Independent Telephone Company's plant, Wallace Avenue, Toronto, with crowds listening over loudspeakers at the Masonic Temple, Christie Military Hospital, and other locations, and that from then until June 22, 1922, regular broadcasts were continued. On June 22 a complete station was installed in the Star office by Dr. Chas A. Culver of the Canadian Independent Telephone Company. On June 27, 1926, the Canadian Association of Broadcasters obtained a charter, the purpose of the association being to "represent all broadcasting stations throughout the Dominion." The first officers were: President, J. N. Cartier (La Presse), Montreal; Vice-President, Main Johnston (Toronto Star); R.H. Combs (CKNC) and A. L. Bell (CKCK), directors and A. R. McEvan (CNRO), Secretary-Treasurer. Harry Sedgwick (CFRB), Toronto; G. C. Chandler (CJOR), Vancouver; J. N. Thivierge (CHRC), Quebec; Gordon Love (CFCM), Calgary; Maj. W. C. Borrett (CIINS), Halifax; Dr. G. M. Geldert (CKCO), Ottawa, and Don Copeland (CJRC), Winnipeg. Since that time the Association has continually expanded and meetings have been held annually. 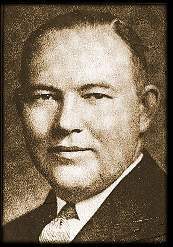 At the last meeting, held in January, 1941, a permanent President and General Manager, in the person of Mr. Glen Bannerman, was appointed. Mr. Sedgwick remaining as Chairman of the Board. Office accommodations has continually expanded and much has been done by the Association to eliminate bad practice in radio advertising, to encourage radio advertising as a medium, and generally to protect the interests of the radio industry. Illustrating the early record of radio broadcasting in Canada is the reproduction of an article from the Montreal Daily Star, of Friday, May 21st, 1920, describing a broadcast, conducted the previous evening between the Canadian Marconi Company's plant in Montreal and the Chateau Laurier, Ottawa. An article in the Canada Year Book, 1934-35, page 787, also records this human voice in Canada. In reports of early broadcasting appear conflicting statements and some confusion regarding the term "wireless telephony" and "broadcasting". This is, no doubt, due to the fact that early stages of broadcasting were not as we know them to-day. Organized programming and regular schedules were not practiced at that time, because that phase of the radio science was still in the experimental stage. The Canadian Marconi experimental broadcasting activities took place during the summer of 1919, when they put into operation the first broadcast transmitter ever to be used in the Dominion of Canada. This experimental station's call letters were "XWA", and the station was located in their factory on William Street in Montreal and operated on 12OO metres. "The first time we have any record of broadcasting' in Canada is when the Canadian Marconi Company were authorized to transmit programs on an experimental basis during the latter part of 1918 and, also, in the winter evenings of 1919 over their station XWA in Montreal. These early transmissions were, of course, heard only by amateurs and others technically equipped to receive them, but the publicity thus obtained created a demand for regular service. Application was, therefore, made by the Marconi Company for permission to broadcast regular advertised programs and official authority to this effect was granted on November- 4, 1920, and a regular service was immediately inaugurated by the company. At that particular time, the production of transmitters for broadcasting purposes was in the development stage, but it was not until 1922 that there was a general demand for broadcasting services in other parts of Canada. Accordingly, for the fiscal year 1922-23 provision was made in our regulations for a special type of licencee for broadcasting stations. It then became necessary also to open a new block of call letters in order to take care of this new group of stations and accordingly advantage was taken at that time to change Canadian Marconi's call letters for their, Montreal station from XWA to CFCF." WHEN WAS FIRST CANADIAN BROADCAST? The honour of making the first Canadian broadcast belongs, we believe, to the Canadian Marconi station XWA, Montreal, whose early activities are described in another article accompanied by the reproduction of a descriptive article from Montreal Daily Star, of May 21, 1920. "My own station was, I believe second in Canada and undoubtedly the first in Western Canada. It first went on the air Feb. of 1921 under the call letters of 4AII until soon after standard broadcasting licences were issued and the call changed to CKZC. It was two or three months later before any kind of a regular broadcasting schedule was inaugurated. Later in the year my company, (Salton Radio Engineering Co.) received the Winnipeg Free contract to build a station for them and until this station was completed in May, 1922, my own station CKZC broadcasted alternately under my own call letters and those of the Free Press, CJCG. Thus, although the Free Press was actually on the air considerably in advance of the Winnipeg Tribune, the two newspapers started broadcasting from their own stations almost simultaneously in May, 1922. It might be of interest to you to note that what was considered to be the first public broadcast in the world from a moving vehicle, took place in Canada. I am forwarding a photo from my files, which I would like returned, which illustrates this event. 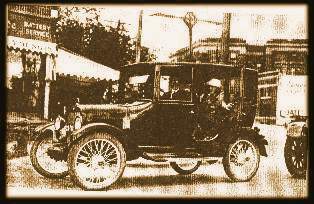 Early in May, 1922, I put the Free Press' own station on the air and equipped my car with a portable broadcasting and receiving station. About a week later, still in May, 1922, Miss Louise Lovely, a Hollywood Moving Picture Star, was making a personal appearance in Winnipeg and it was arranged that she would make this world's premiere broadcast, while I drove the car around the streets of Winnipeg. In the photo you will notice the front of a car immediately following and there was another immediately preceding my car, and these two cars carried the Pathe and Fox newsreel cameramen respectively, who recorded the event which was shown to world wide coverage. The broadcast consisted of a short two-way conversation between this portable station and the Free Press station, to be followed by a straight broadcast from the car (of course in motion all the time), and later a follow-up broadcast from the Free Press station. Incidentally if you would like to verify the date, you might notice that the licence plate on the front of my car is a Manitoba 1922 plate." "The first radio broadcasting station in the modern acceptance of the word, that is, for entertainment, was opened by The Winnipeg Tribune, April 17, 1922. It continued in operation until March 9, 1923, when it surrendered its franchise to the Manitoba Telephone System Station, CKY, which is still in operation. Its manager was Donald Bankart, (now advertising manager Northern Electric Co. Ltd., Montreal). It was a Marconi, installed by L. Stanley Payne. It tried, unsuccessfully, to contact the High River, Alta., station, a distance of 600 miles. CJNC was a station opened on May 3, 1922, by the Canadian National Railways. This station continued until the Bennett regime, and its major business was to provide programmes to entertain in railway passengers in Pullman cars."